Construction : Aluminum – alloy. With more than two decades of experience in the field of Industrial Safety Products, we have emerged as a respectable leader for the supply of Solar Studs. Solar Road stud, having 3 led on each side. We are offering Solar Road Stud to our clients. This road safety product is manufactured by our expert professionals. 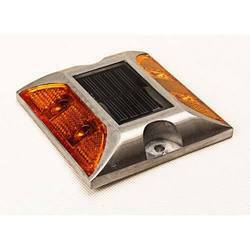 This Solar Road Stud is available in different colors and sizes. It provides clear visible traffic guidance to people in all weather conditions. The blinking on the roadside in the night giving indication of the long roads without any conventional electricity is only possible with the efficient Solar LED Road Studds. 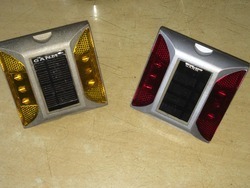 Backup of 2-3 days, these blinkers are having LEDs with long intensity illumination which enable the driver to obtain the road side even in the dark night without street lights. Applications: Solar powered and Solid Aluminum-alloy Shell road stud that Waterproof, Energy-saving and can be used for traffic signal project.